Blast your way to good times with Toy Story Game Time Party Supplies. This galactic pattern is sure to please kids of all ages with its bright graphics and popular characters from the Toy Story Movie franchise. Score big with your guests by stuffing treat bags with Toy Story Party Favors and Stickers, and give away special treats as prizes for party games. Toy Story Game Time Birthday Party 7" Square Dessert Plates, 8ct. 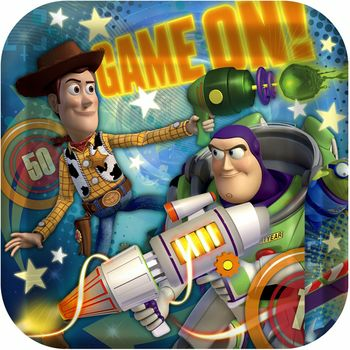 Toy Story Game Time Birthday Party 9oz. Paper Cups, 8ct. Toy Story Game Time Happy Birthday Banner, 1ct. Toy Story Game Time Birthday Party Plastic Treat Bags, 8ct. Disney Toy Story Game Time Birthday Party Invitations, 8ct.